Play Mint Works on Tabletopia now! Mint Works is a refreshingly light worker placement game for 2 to 4 players. Easy-to-learn yet deep enough to keep you coming back. During the game you will have a limited amount of Mint Tokens, which represent your workers. You will use these mint tokens to earn more tokens, take first player, or buy and build plans that will bring you victory points. 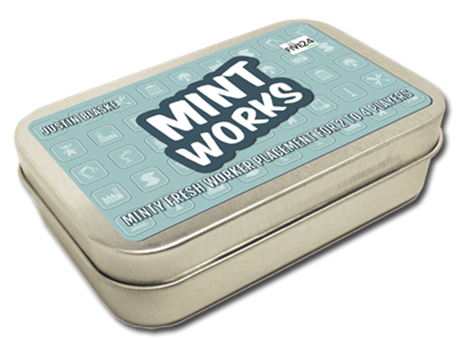 Mint Works was created in response to the 2015 Mint Tin Design Contest. The game is now on Kickstarter (funded in just over 7 hours), check it out! A twenty minute Euro is hard to make, and even harder to make fun. This game delivers all that and more."